Cover: What - me Barry? 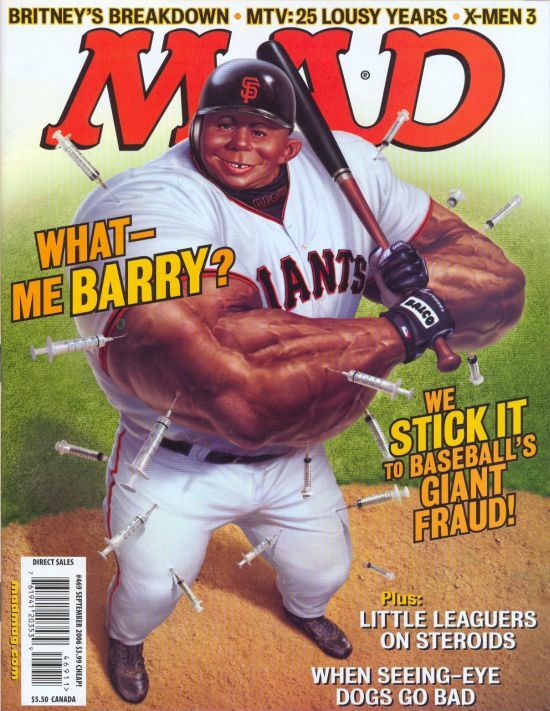 We stick it to Baseballs Giant Fraud! The Fundalini Pages; "Fundalini Advisory", " The fast 5 possible mission names for a invasion of Iran", "Pull my Cheney", "MADs 15 minutes of Fame: Kaavya Viswanathan", "Creative solutions for stemming the flow of illegal aliens across our borders", "Positive uses for Snakes on a plane", "Chaet Codes for Pixars Cars: The Game", "Saddam Sez", "The Godfrey Report", "The NFLs Ref Report: This month "
MADs exclusive outtakes from Britneys dateline NBC interview!